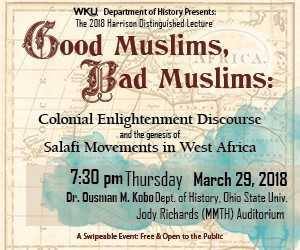 The 2018 Harrison Distinguished Lecture will be presented by Dr. Ousman Kobo, Associate Professor of History at the Ohio State University. Dr. Kobo’s talk takes as a starting point the question: why did the rejection of secular education by the leaders of Boko Haram, the notorious Nigerian terrorist group (whose name is often translated as “Western education is a sin”), appeal to a segment of Nigerian Muslim youths? His talk traces the historical roots of non-violent Salafi/Wahhabi movements in West Africa to colonial secular education and the departure of groups such as Boko Haram from the mainstream Salafi movement. It then explores how, at the end of colonial rule in the 1960s, pro-independence Muslims with secular educations who were critical of the broader impacts of colonial rule applied Enlightenment discourses and the colonial critique of Islam to explain what they considered limited spiritual and material progress among Muslims. Their search for an “enlightened” Islam encouraged them to gravitate toward young Salafi/Wahhabi scholars who were preaching a new form of Islam that challenged the status quo and offered new opportunities to recreate the “authentic” Islam of the Prophet’s era. The two groups’ self-conscious promotion of what they considered an enlightened and spiritually purer Islam in step with the emerging post-colonial realities helped the rapid growth of Salafi/Wahhabi movements in West Africa between the 1960s and the 1980s. The more recent rise of Boko Haram in Nigeria, in contrast, is a radical attempt to reverse that alliance, and to reset the clock to the era before what Boko Haram leaders declared the “corruptive” tendencies of secular education and modernity left Muslims spiritually and materially bankrupt. Dr. Kobo holds a Master’s degree in International Relations from City College of New York and a Ph.D. in History from the University of Wisconsin-Madison. His research and teaching interests include 20th century West African social and religious history; contemporary Islamic history; Sufism; Islam under French and British colonialism in Africa; and the social history of West African migrants in the United States. His book, Unveiling Modernity in West African Islamic Reforms, 1950-2000 (Brill Publishers, 2012), documents and compares the histories of contemporary Islamic reforms associated with Wahhabism in Ghana and Burkina Faso and the ways the rise of Wahhabi-inclined movements at the end of colonial rule helps us understand Muslims’ engagements with modernity. He has received prestigious awards and grants including a MacArthur Fellowship for International Peace and a Boren Fellowship and has been a Visiting Scholar at the Center for Islamic Studies at the University of Oxford (UK). He is currently working on his second book tentatively titled, The Gun and the Rosary: Subtle Relations of Co-existence between Charismatic Muslim Leaders and French Colonial Administration in Burkina Faso, 1920-1946. The Harrison Lecture series was established in 1993 through the generosity of Lowell and Penny Harrison to bring leading historians to share their work and ideas with the WKU community. Professor Harrison was a longtime faculty member of the WKU Department of History and a widely respected scholar of U.S. history.